For this episode, LaCoste, with Absolute Charters, went looking for flocks of birds in one of Dularge’s large lakes on the coast. 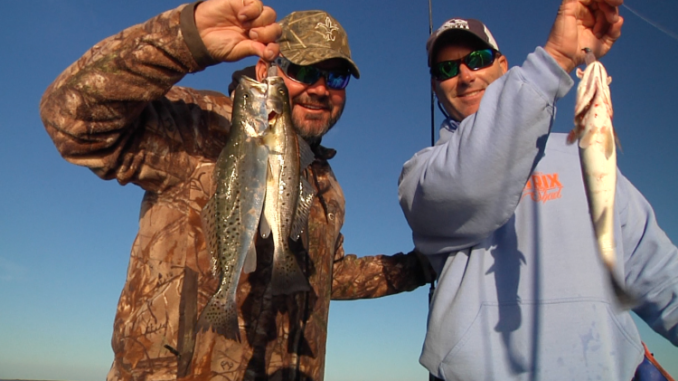 He put Sportsman TV host Greg Hackney right on the goods, and the two caught trout nearly every cast. The bag was mixed with some keepers and some throwbacks, along with bonus white trout included, and LaCoste provided some advice on white trout if you decide to keep them. They key to success was to get out early before sunrise and be at the spot just as fish started to bite. They used popping corks and soft plastic baits, which are detailed in the show. After catching a nice box of trout, they decided to target another species: sheepshead. In the episode, you’ll see where the sheepshead gang up and what technique to use to make sure they bite.